Winning the 2008 Olympic title is one of my favourite memories. Looking back, I was a child – a young lady who would look to coach Bobby Kersee and say: ‘What am I doing here? I want a medal. What does it take?’ And he would say: ‘This is what it takes’ and I would do exactly that. The other highlight was 2012 when I went to that Olympics and I felt that I was a mature woman and my conversation with Bobby was very different. It was more like him saying: ‘What do you need right now? I know you’re ready. What is the fine-tuning you want to do?’ So for him to trust me and instil in me that I was ready. We have been through so much together and he does not realise how much he has helped me grow, on the track and off the track. So those are the two highlights. In 2012 I ran a PR but finished second. Man, it was a heck of a race, something that I’ve always wanted. Whatever race it was, when that time came, you would be ready. And I was. I feel that there are so many people in their career, and they were injured or the other person didn’t perform or you won easily. And that race made history by being the fastest race in Olympic history. For me to be ready and actively participate in that – that is what dreams are made of. Then London 2017 came down to two vets – Sally Pearson and me. As Sally said afterwards, she knew that I was the only one who knew how to do rounds. And I knew Sally could do rounds. It was great to be the oldest in the field and the only American to walk away with a medal. ‘I think I’m still doing OK. I think I’m still doing all right’. 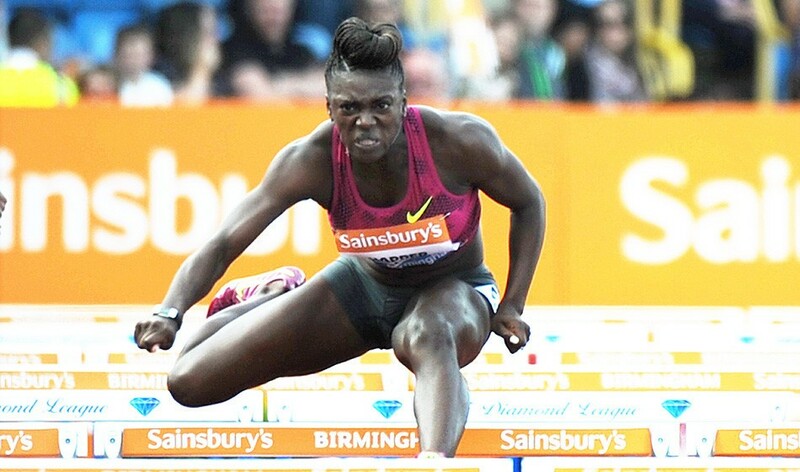 In the 2015 World Championships I hit a hurdle and fell. In that moment you have to remember that you work extremely hard but sometimes it doesn’t work out. It’s one of those situations where you put up or shut up. You tell young athletes: ‘It won’t always work out but stay strong and keep working’. And in that moment you have to practice what you preach and you have to live to fight another day. And I went on to have a great season afterwards and win the Diamond League. It was a bump in the road – it wasn’t a fun bump but I learned so much about myself from that. Since high school, on the blocks I would do a kiss on my hand and a point up to God because he was the reason I was running and he gave me my talent. It is to remember, good or bad, that I have been blessed. I have always known that there would be an end to my career and I always had that in the back of my mind, thinking I want to do the best that I can so that when I come to the end I won’t have any regrets. I’m getting to the point where I’m ready to be someone’s mom. I have always wanted to be an Olympic champion, a wife and a mom. I have done two out of three. I think it’s time. I shed tears but I’m happy.